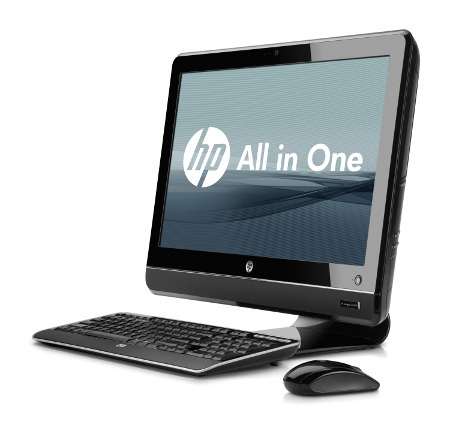 HP, the top computer manufacturer in the world, has just rolled out its latest all-in-one PC that will target enterprise markets, under the guise of the HP Compaq 6000 Pro family, which will deliver proven performance and reliability to customers in an easy-to-use, space-saving design that features integrated collaboration tools. Boasting a one-cord design, you can be more or less guaranteed to enjoy an easy, out-of-the-box setup and serviceability, making sure that cable clutter is removed while enjoying a much more functional workspace be it in office cubicles or other shared environments. The HP Compaq 6000 Pro All-in-One is no slouch when it comes to performance, since you will be able to opt from a choice of Intel Core 2 Duo processors, Windows 7 Professional 32- or 64-bit operating system, cram in up to 8GB of DDR3 memory, boast up to 1TB of hard drive space, not to mention having the option of throwing in an 80GB solid state drive as well. Apart from that, you will be able to enjoy plenty of viewing real estate with its 21.5″ full HD LED backlit HP BrightView LCD screen with dual display capability, where you can enjoy crisp videoconferencing for face-to-face communication, and having its potential maximized through Bluetooth wireless connectivity. Digital content can be easily produced and shared thanks to its 16x Max SuperMulti optical drive and slim-tray DVD burner with LightScribe, and with a host of connectivity options including seven USB ports and an IEEE 1394 FireWire port, data transfer is but a snap. You should also not have any problems with any memory cards these days, since it ships with a six-in-one memory card reader, optional MXM graphics and optional TV tuner offer enhanced multimedia flexibility. Each purchase comes with a full version of the HP SkyRoom videoconferencing collaboration tool that costs $100. Expect the HP Compaq 6000 Pro All-in-One Business PC to hit the US from July 16th onwards, with prices starting from $899.